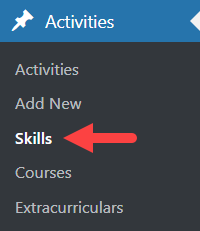 Note: The skills will only appear listed under Skills on your website menu if they are checked off when adding/editing an Activity. 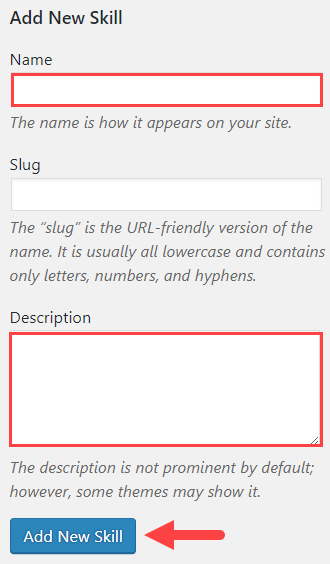 Example: Go to https://christayeung.ubcarts.ca/, scroll down to the skills section on the homepage. The descriptions appear below the skill heading. How do I decide what Skills to ad to my Activities? competencies, abilities, knowledge, talents, strengths, areas of specialty. The Activities to which certain Skills are assigned should be thought of as containing the artifacts and evidence, or in other words, the proof that you can perform those skills. Look at the requirements listed on job descriptions, grad school programs, scholarship applications, etc.